The ﬁrst broadcasts of the Boston Red Sox games were also heard on WNAC, beginning in 1926. Shepard, encouraged by his chief engineer Paul DeMars, became an early believer in FM, and in 1939-1940, he set up New England’s ﬁrst FM radio network. John Shepard III founded WNAC radio (today WRKO), WNAC-TV (today WHDH-TV), the Yankee Network, and the Yankee News Service. He was one of the founders of the National Association of Broadcasters, and he also created an early FM network. Shepard came from a family of merchants, owners of the Shepard Department Stores, and he was expected to follow in the footsteps of his father and grandfather. But he was bitten by the radio bug and put WNAC on the air in late July 1922, with its original studios on the fourth ﬂoor of the Boston Shepard Store. People came to watch the live broadcasts, and they also purchased radios, records, and other items while in the store. Early radio was largely a volunteer effort, but Shepard paid many of the performers, and as a result, was able to attract better-known entertainers. He was also an innovator: In 1924, WNAC was the ﬁrst to broadcast synagogue services from Temple Israel for shut-ins (previously, only church services had been offered); in 1927, the ﬁrst to try home-shopping, with an all-female staff of announcers; and in 1934, the ﬁrst to create a regional information service that focused on New England news. The ﬁrst broadcasts of the Boston Red Sox games were also heard on WNAC, beginning in 1926. Shepard, encouraged by his chief engineer Paul DeMars, became an early believer in FM, and in 1939-1940, he set up New England’s ﬁrst FM radio network. And in the television era, Shepard put Boston’s second TV station, WNAC-TV, on the air in late June 1948. Many New Englanders remember Shepard for the Yankee Network (“News while it IS news; the Yankee Network is on the air!”). Beginning in 1930, it continued to grow, and in its heyday, it had afﬁliates throughout the six-state region. Shepard fought for (and won) the right of radio journalists to get the same credentials as print journalists, and the Yankee News Service was a reliable resource for radio news for more than three decades. 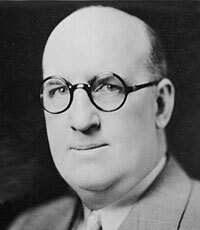 John Shepard III died in mid-June 1950, at the age of 64.